This week for Iron Craft I challenged everyone to make something inspired by their heritage. Who knew that from the challenge post I would actually get in contact with someone who knew a little more about my family’s past. In the challenge post, I put up a picture of my grandmother when she was teaching in a one room schoolhouse in Dentaybow, MN in 1926. At the same time the Densmore family was researching their family roots in Dentaybow and came across my picture through a Google search. They left me a comment on the blog saying that my grandmother probably taught their mother, aunt and uncle. 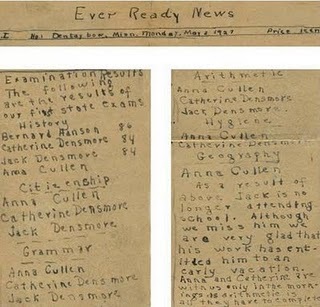 Well, when my dad saw that he started doing some research and found this handwritten “newspaper” that my grandmother had created about her classes grades. Wouldn’t you know it, there were Jack and Catherine Densmore! This is the second time posting an old family photo online has lead us to someone with more information about our family. (The last time a photo of my great great grandmother’s funeral on Flickr lead us to a whole side of the family we didn’t know existed). The internet has really made it a small world. Anyway, on to my Iron Craft project. I’ve been meaning to make some new throw pillows for our living room. I knew I wanted to do a Scandinavian design as that type of clean style goes well with our furniture. 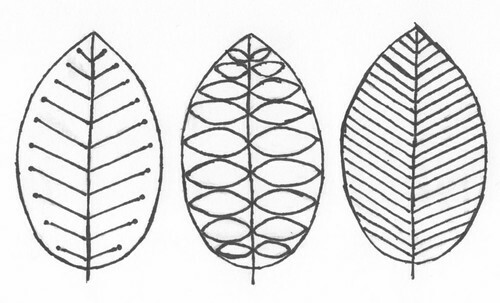 After looking through lots of images of Scandinavian pottery, I drew up this leaf design. Feel free to use this embroidery pattern for your own personal use but, do not use it commercially, thanks! 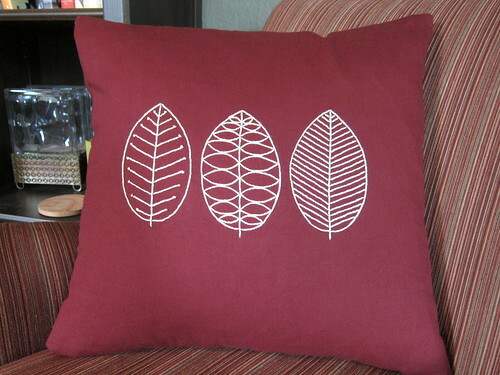 I chose a cotton upholstery fabric in a wine color for the pillow and pearl cotton #5 in ecru for the embroidery. I thought the pearl cotton gave a good thick line. ves so, you’ll notice I didn’t get all concerned about things being evenly spaced or symmetrical. I wanted it to look home-stitched. 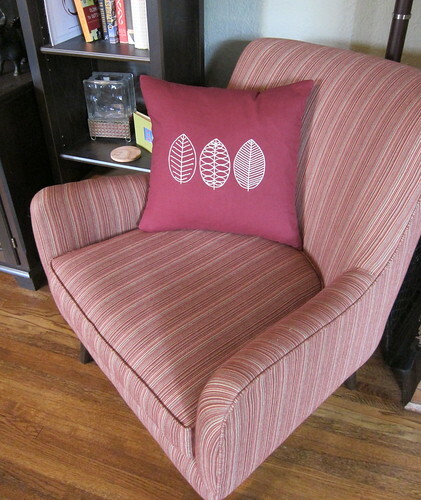 All and all, I’m very pleased with how it turned out and look how perfect it looks in our chair. Love this pillow. I it is perfect with the chair. Love the clean lines. Love the picture of Marguerite. I love her dress. Love those old photos. We have a few around here and they are prized. Love the pictures, and the story too! Love the Pillow! Splendid! I also love any opportunity to connect with previously unknown, or at the very least not very well known, family. 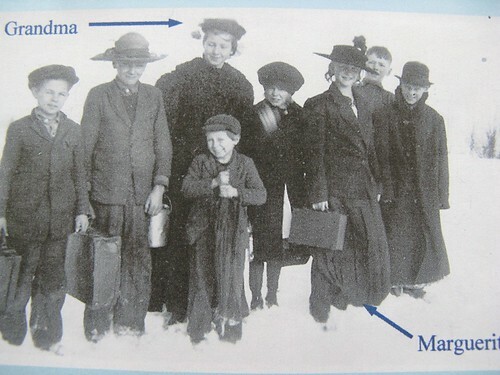 My paternal grandfather grew up in an orphanage so we know next to nothing about his parents. However, about ten years ago his half sister (who had been adopted and grew up in a very nice Swedish family) contacted us. Lovely stuff.